The Standard on Automatic Exchange of Financial Account Information (the AEOI Standard) is being implemented on a global scale. This global reach is a key element to ensuring its effectiveness in combatting tax avoidance and evasion. 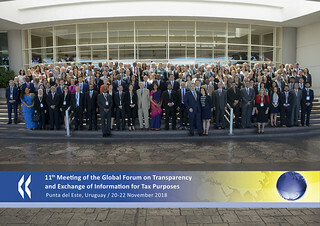 The Global Forum on Transparency and Exchange of Information for Tax Purposes is at the forefront of driving the global implementation of the AEOI Standard, through monitoring, assessing and assisting in its implementation, in addition to its ongoing work to to ensuring the effective implementation of the standard of Exchange of Information on Request (EOIR). Over 100 of the Global Forum’s members are committed to implementing the AEOI Standard and the Global Forum is working to ensure the effective delivery of the commitments. Calling for commitments to implement the AEOI Standard and then monitoring their delivery in real time. Reviewing the implementation of the AEOI Standard, including its effectiveness in practice. Providing assistance in the implementation of the AEOI Standard. In order to ensure the widespread implementation of the AEOI Standard the Global Forum initiated a commitment process in 2014, whereby all developing countries and financial centres were invited to commit to implement the AEOI Standard in time to commence exchanges in 2017 or 2018 and to exchange information with all interested appropriate partners (being all those jursidcitons intertested in receiving information and that meet the expected standards in relation to confidentiality and data safeguards. Over 100 jurisdictions made such a commitement, including some developing countries not invited to do so. Commitments to implement the AEOI Standard continue to be made by developing countries not originally invited to commit (due to the capacity constraints they face and their reduced risk to the level playing field) but that wish to benefit from the AEOI Standard. The Global Forum is monitoring each milestone in the delivery of the commitments and publishes the results each year. This shows that over 85 jurisdictions successfully exchanged financial account information in 2018. The Global Forum put in place a “Staged Approach” to monitor, assess and assist the implementation of the Standard during the implementation process. This started with assessments of the confidentiality and data safeguard standards in place in each jurisdiction, followed by the assessment of the domestic legal frameworks being put in place to ensure financial instgitutions collect and report the information to exchange, and a mechanism to facilitate exchange agreements being put in place between all interested appropriate partners. As part of the Global Forum's mandate to ensure the effective implementation of tax transparency standards worldwide, the Global Forum will move to conduct peer reviews of the effectiveness of the implementation of the AEOI Standard in practice, starting in 2020. As a first step, the Global Forum has adopted a Terms of Reference to use in these peer reviews. The Terms of Reference incorporate aspects in relation to both the legal implementation of the AEOI Standard and its effective operation in practice. The Global Forum is now working on the Methodology with which to conduct the AEOI peer reviews in relation to the effectiveness of the implementation of the AEOI Standard in practice. This will incorporate lessons learned from the early exchanges as well as build on the assessments that have already been conducted. The Global Forum engages in a range of activities to support its member jurisdictions in effectively implementing the international standards on transparency and exchange of information, and ensuring that exchanges between members’ tax authorities are efficient and of high quality. Assistance is provided for both Exchange of Information on Request, and Automatic Exchange of Information. For further information, please visit www.oecd.org/tax/transparency/.